Dirigible Over Texas, U.S.S. Shenandoah. Like a scene from a black-and-white science fiction movie, Texans stopped in their tracks and poured out of buildings to look skyward as the huge silver object sailed over head. Longer than two football fields, it glided across much of the state in early October 1924, drawing crowds and making headlines as it went. But this was no UFO � in fact, the term hadn�t yet been coined. What Texans saw that long ago fall was the Navy�s newest and largest dirigible, the U.S.S. Shenandoah, the first rigid airship to fly coast to coast. Launched Aug. 20, 1923, the 36-ton Shenandoah stretched 680 feet long, extended 78 feet at her beam and 93 feet, 2 inches high. Propelled by 300-horsepower engines, she could reach 70 miles an hour with a range of 5,000 miles. Carrying a crew of 35, and longer than many sea-going vessels, she was a ship that sailed the air. The Shenandoah was based at the Lakehurst, NJ Naval Air Station, which is where she had been constructed. But in the winter of 1923, the Navy decided to fly the big blimp from New Jersey to the West Coast, preparatory to a contemplated polar exploration mission. Rather than have her cross the Rocky Mountains, naval brass opted for a southern route where the airship could fly lower and expect better weather. The big blimp�s only scheduled stop was Fort Worth, where she arrived ahead of schedule Oct. 8. Not only did Texans find that exciting, a native son served as the ship�s navigator. That was 32-year-old Lt. Charles Emory Rosenthal of Cleburne, a 1914 Naval Academy graduate. Another Texan on the ship was Lt. T.G.W. Settle of San Antonio. In addition to being in charge of plotting the Shenandoah�s course, Rosenthal had an even more critical responsibility � overseeing mooring operations when the huge airship connected to the 165-foot steel mast constructed in Tarrant County to handle what civil and military aviation pioneers expected to be a surge in cross-county dirigible traffic. The Fort Worth facility was the only waypoint for blimps between the Atlantic and Pacific and one of only a handful in the world. The Shenandoah left Cowtown at 9:45 a.m. Oct. 9 and made her way westward along the route of the Southern Pacific Railroad, reaching Eastland at 12:50 p.m. By 2:30 p.m., making 45 miles an hour and fighting a strong southerly wind, the airship appeared 3,000 feet over Abilene. At that altitude, she could be seen from 45 miles in any direction. Three hours and 15 minutes later, people in Midland turned out to watch the silver giant float overhead. As the sun set that day, the Shenandoah continued to the west. At 9:05 p.m., the railroad dispatcher at Kent, 163 miles east of El Paso, telegraphed that he could see the airship�s lights. Forty-two minutes later, at 8:47 p.m. Mountain time, the airship was over Van Horn. The Shenandoah passed over El Paso at 10:30 p.m. Mountain time. From Texas, she proceeded across New Mexico and Arizona to San Diego, where she arrived the night of Oct. 10. From there, she traveled up the California and Oregon coasts to Washington State. 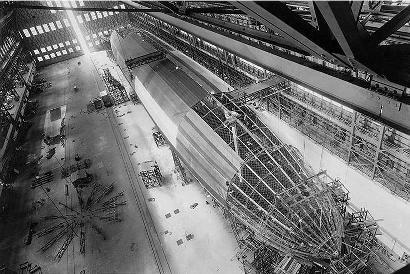 Not quite a year later, the airship lay in its enormous hangar at the naval air station in New Jersey, being readied for another cross-country flight, her 57th extended ascension. She left Lakehurst on Sept. 2, 1925. The young officer from Cleburne, now Lt. Commander Rosendahl, was still a crew member, though Lt. Settle did not make this flight. But another Texan, Austinite Lewis Hancock, Jr. now served as the ship�s executive officer. The following morning, the Shenandoah encountered a violent thunderstorm over Noble County in southern Ohio and broke apart in mid-air. Since the airship relied on non-combustible helium and not the explosive element hydrogen, the blimp did not burst into flames and Rosendahl succeeded in bringing down the bow portion of the airship softly. He and 28 others survived, but 13 men, including the lieutenant commander from Austin, died in the crash. Despite the disaster, Rosendahl stayed in the Navy, primarily in its rigid airship branch. Back in the traditional fleet for a time during World War II, he served as captain of the heavy cruiser U.S.S. Minneapolis and received a Navy Cross for his role during the South Pacific Battle of Tassaforonga in November 1942. He retired as a vice admiral in 1946 and settled in New Jersey, not far from Lakehurst, the home of lighter-than-air aviation. In 1962, as a younger generation of naval aviators trained for space flight, the Navy decided it no longer needed dirigible. In recognition of his status as one of the pioneers in the field, the Navy let Rosendahl go up on the military�s final blimp flight.